This Case History covers two systems built for precision cleaning of hydraulic manifolds used in aerospace and automotive application. The manifolds were highly machined, complex, and with many internal passageways that had to be thoroughly cleaned to a high cleanliness level. In both cases, the customer required a simple system. Hand clean afterwards or using special tooling to fixture each manifold were unacceptable due to the throughput requirements and labor considerations. The process objective of the first system (shown immediately below) was to fully remove lubricants and surface soils from outside and especially inside manifolds using a standard batch system that could handle a wide variety of sizes and configurations (up to a 42″ long x 30″ wide with maximum gross weight of 1000 pounds). 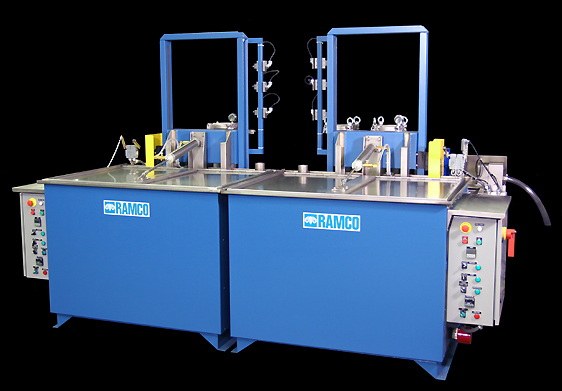 RAMCO Equipment precision cleaning of hydraulic manifolds used in aerospace and automotive application. To handle the wide assortment of complex manifolds a comprehensive dynamic flow package was designed and installed into the Wash and Rinse Stages. Long stroke and short stroke oscillation, directional turbulence with lateral and bottom turbo jets, oil removal with SurfaceSweep (to prevent floating oil from redepositing onto cleaned parts), and large capacity stepped-down filtration were all incorporated into an automatic cycle. Other features included Nema 4 panels with lockout-tagout disconnect and stainless steel platform roller conveyors to facilitate transfer between stages without having to lift manifolds. 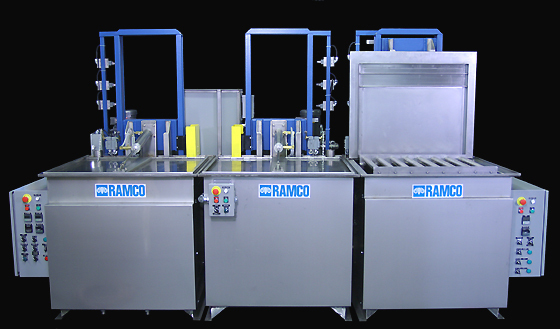 RAMCO system uses an elevator within each processing chamber. RAMCO Equipment turbulation in action. The process objective of the second system (shown below) was to fully remove lubricants, surface soils and fine contaminants from outside and inside substrate of the manifolds using a standard batch system that could handle a wide variety of sizes and configurations (up to a 24″ long x 24″ wide with maximum gross weight of 1000 pounds). 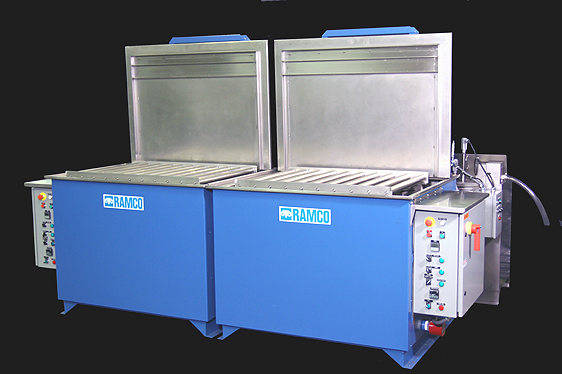 RAMCO Equipment Precision Wash, Rinse, and Hot Air Knife Drying Stages. To achieve this objective ultrasonics was added to the wash stage designed and sequenced to work in conjunction with the turbo/agitation phase. 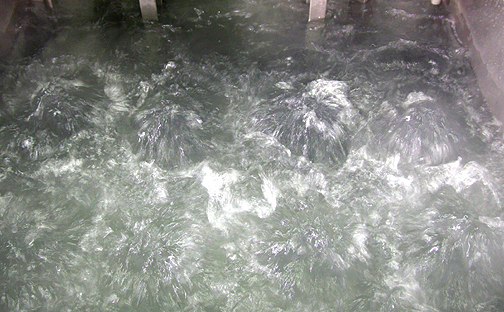 This “combination process” has been a RAMCO specialty for over 25 years used in our Dynamic Flow washing systems. The overall system as above consists of Precision Wash, Rinse, and Hot Air Knife Drying Stages. Each stage abuts to minimize overall footprint.